Seafood in the desert can’t possibly be good right? Wrong. Despite being in a landlocked state, we get some pretty great seafood in Arizona. One of these fantastic restaurants is Ocean Prime. Ocean Prime is unique in that while they are more of a fine dining restaurant, the atmosphere is very relaxed and not pretentious at all. Located in North Phoenix’s High Street, the restaurant doesn’t have the stuffy steakhouse feel you might expect. Located in North Phoenix’s High Street, the restaurant doesn’t have the stuffy steakhouse feel you might expect. 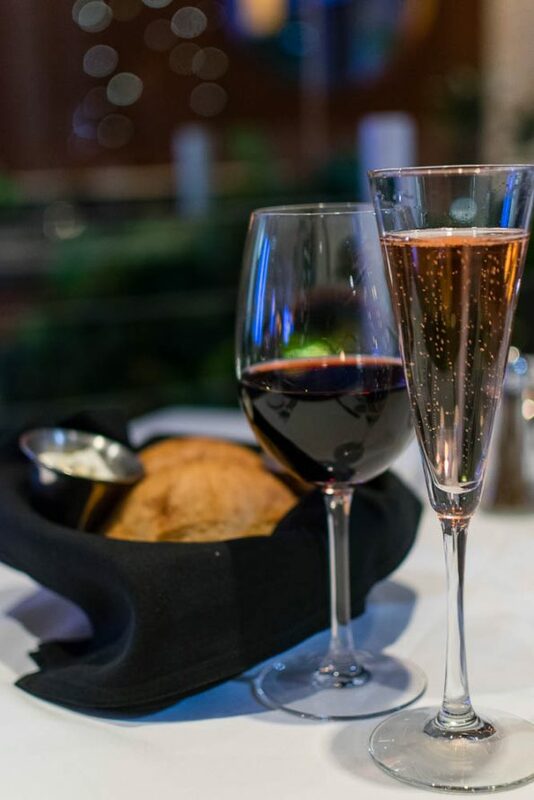 The are 3 different areas to dine: the dining room (a hip dining space), an outside heated patio (a romantic space that is quieter), and the bar (definitely full of activity). We dined outside on the patio which was very relaxed and intimate. When it comes to the food, Executive Chef Jagger Griffin tries to keep it light and fun. With the menu at Ocean Prime, he really wants to convey high-end quality and ingredients without the stuffiness expected from fine dining. Additionally, they have a really fantastic selection of wine which actually lured us away from their cocktails! We recently were treated to a dinner at Ocean Prime in order to learn a bit more about their offerings. Below is a breakdown of things we tried. 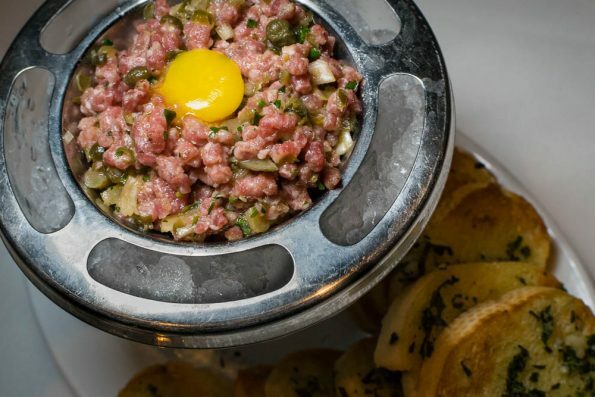 Prime Steak Tartare (Capers, Shallots, Crostini)- Beef tartare is one of our favorite menu items! While you see this classic on menus periodically, it is not nearly enough for our taste. The Prime Steak Tartare at Ocean Prime was really interesting in that they add a bit of honey to it. If you didn’t know this you might not pick it up but once you are told it changes the whole flavor and is really incredible. Chilled Crab Meat Cocktail– Crab Meat Cocktail was one of the coolest food presentations of the evening. It is served in a bowl with dry ice under it. Not only does the presentation wow diners, but the crab meat is delicious! You can really taste the quality. It was so good on its own that we all but ignored the Louie sauce that was served with it (which was also good). 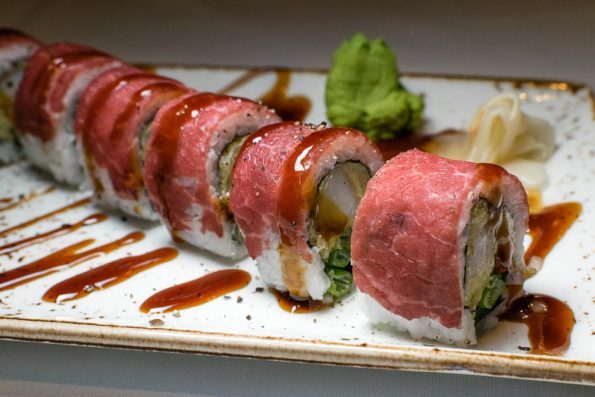 Prime Roll (Tempura Shrimp, Cream Cheese, Scallion, Beef Carpaccio)- Another classic appetizer we love is Beef Carpaccio. Imagine our surprise when we saw it paired with sushi! This roll was really tasty! What really stood out was the use of black pepper. Florida Grouper (Lobster, Gnocchi, Spring Peas, Lemon Jus)- Our server told us when we were ordering that the grouper was particularly good that night. We went with his suggestion and were so happy we did. The fish was not only cooked to perfection but the flavor of the dish was light and very bright. It has a bit of tomato sauce on it which provided a lovely balance with its acidity. 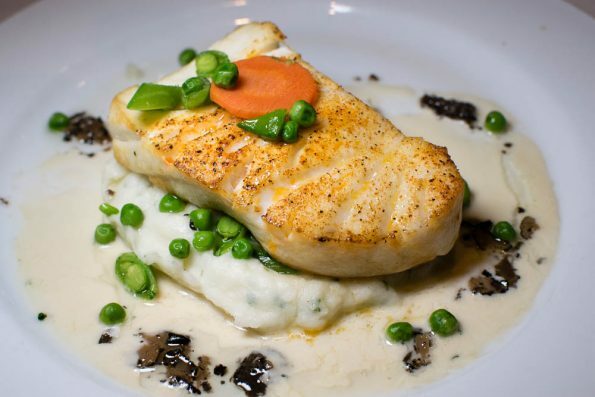 Chilean Sea Bass (Whipped Potatoes, Champagne Truffle Sauce)- We were told that the Chilean Sea Bass is one of the most popular dishes at Ocean Prime. It was a beautifully delicate preparation. 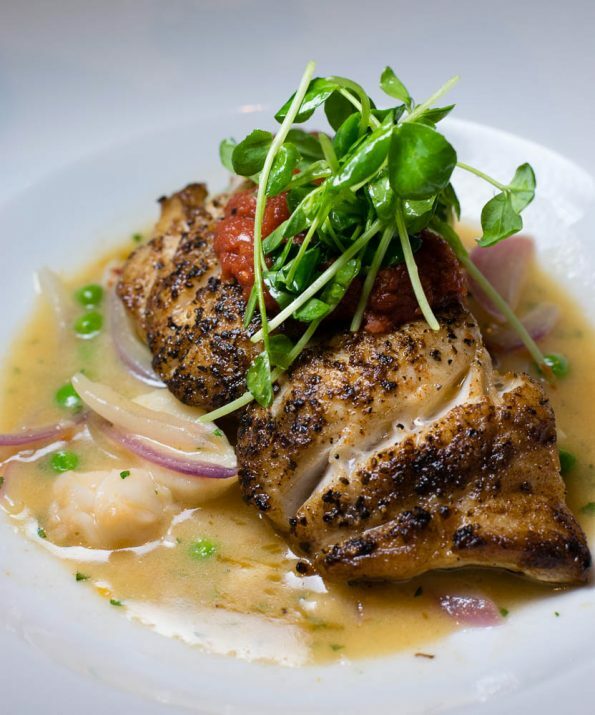 Where the Grouper was light and bright, the Sea Bass was rich and decadent. The sauce was to die for as well! It is easy to see why this dish is so popular. Last but certainly not least, we arrive at dessert. Despite being really full, we had to try a couple out! 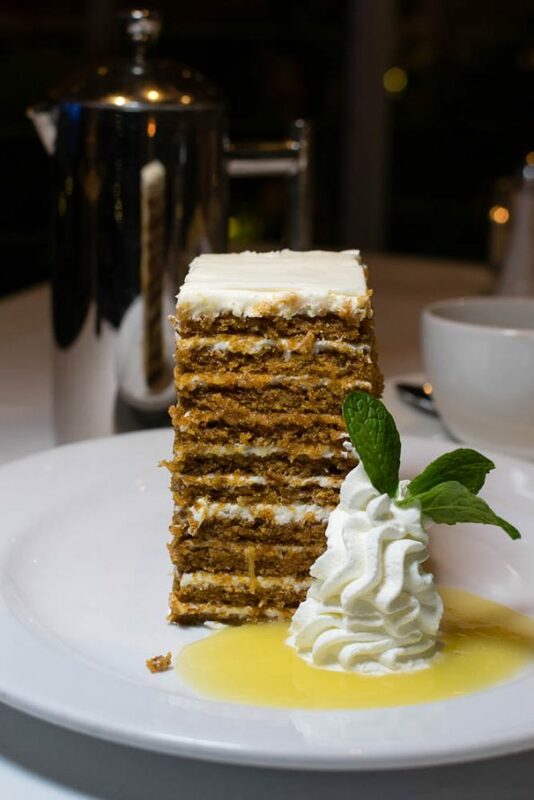 Not to mention on February 3rd, Ocean Prime will be donating $1 of all of their carrot cake sales to No Kid Hungry! Ten Layer Carrot Cake (Cream Cheese Icing and Pineapple Syrup)- Now for the sake of full disclosure we need to admit that we are NOT huge carrot cake fans. We tend to avoid is like the plague in fact. BUT the Ten Layer Carrot Cake is really tasty. What really set this carrot cake apart was the use of Pineapple Syrup. So it looks like we don’t hate ALL carrot cake after all. Blueberry Lemon Cheesecake (Graham Cracker Crust, Blueberry Syrup)- We adore any and every lemon dessert put in front of us. When we saw this cheesecake on the menu we knew we had to order it. 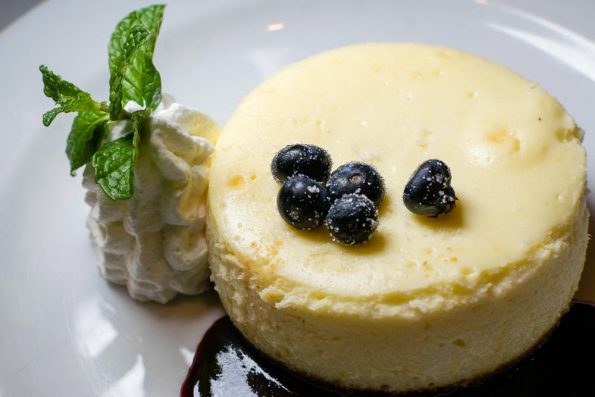 It is a lemon cheesecake with blueberry syrup (“no swirls here”, as our server told us). This is a lemon lovers dream! Tart and creamy, it is exactly what you’d want from this dessert! We really loved our experience at Ocean Prime. We are already discussing our next visit! There is so much left on the menu for us to explore and we really want to try out their cocktails. Don’t forget to head over there is Friday to support No Kid Hungry! You know you want that Ten Layer Carrot Cake!